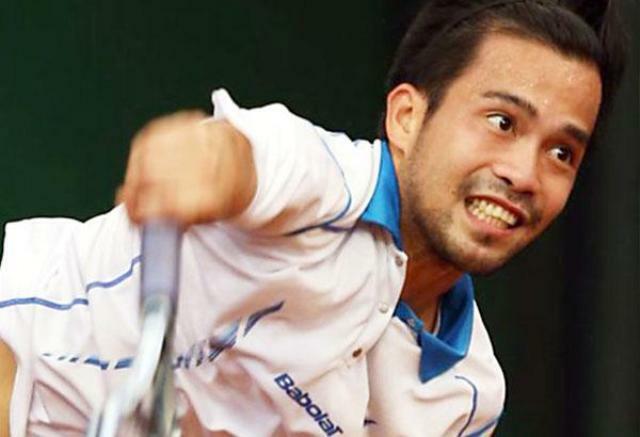 MANILA, Philippines – Francis Casey Alcantara and Indonesian partner Christopher Rungkat sustained their top form and downed Swiss Marco Chiudinelli and Slovakian Lukas Lacko, 6-3, 6-2, last night to advance straight to the finals in the doubles competition of the $75,000 ATP Challenger Philippine Open at the Rizal Tennis Center. Riding the crest of their shock 4-6, 7-6 (10), 10-7 triumph over top seed Ilija Bozoljac of Serbia and Andreas Siljestrom of Sweden Wednesday, Alcantara and Rungkat dominated Chiudinelli and Lacko from start to finish to seal a Final Four showdown with No. 4 Sanchai and Sonchat Ratiwatana, the many-time Southeast Asian Games doubles champions. But the Thai siblings, who eased out Croatians Dino Marcan and Nikole Mektic, 6-4, 6-4, in the other quarterfinal match, later withdrew due to a death in the family, giving Alcantara and Rungkat a free ride to the finals. The 23-year-old Alcantara is seeking his biggest victory since winning the Australian Open juniors doubles crown in 2009. Meanwhile, reversals continued to mar the singles play as Italian Gianluca Naso shocked fifth seed Kimmer Coppejans of Belgium, 6-3, 7-6 (4), to crash into the quarterfinal round. Naso dished out top form to dominate the opening set then held on to frustrate his Belgian rival in the second to complete the straight-set victory and gain a crack at the Final Four against the winner between second seed Mikhail Youzhny of Russia and Jason Jung of Chinese Taipei. Earlier, top seed Luca Vanni of Italy, No. 6 Thomas Fabiano of Italy and No. 8 Somdev Devvarman of India all headed to the exit door after absorbing stinging setbacks to the lesser lights. Vanni fell to Swiss Marco Chiudinelli, 3-6, 6-1, 4-6; Fabbiano lost to David Guez of France, 1-6, 6-3, 3-6, both in the second round; while Devvarman succumbed to Oriol Roca Batalia of Spain, 5-7, 7-6 (0), 7-6 (4), in the opening round. But No. 7 Igor Sijsling and No. 3 Lukas Lacko of Slovakia stayed in the title hunt, trouncing their respective rivals to set up a quarters showdown. Sijsling smashed Amir Wintraub of Israel, 6-2, 6-2, while Lacko repulsed Federico Gaio of Italy, 6-1, 3-6, 6-1.